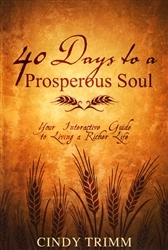 Arsenal Note: This 40 day devotional is based on material found in the book, The Prosperous Soul. It is also available in the package deal along with the book, Study Guide, DVD teaching as the Prosperous Soul Curriculum. It’s time for you to stop settling for anything less than the abundant life that Jesus came to give you. This prosperous life is available to you – it all starts with making healthy soul choices! 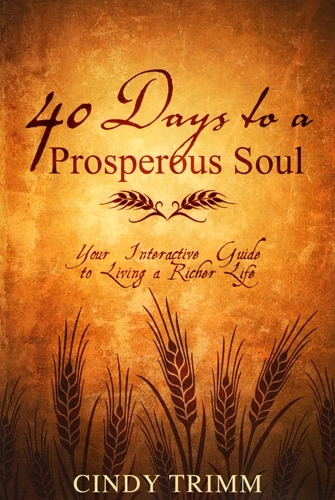 This companion devotional to The Prosperous Soul from Dr. Cindy Trimm will lead you on an interactive 40-day journey to choosing abundance in every area of your life. Over the next 40 days, you will . . .
Be empowered to make decisions that position you to fulfill your purpose and maximize your potential. Learn how to cultivate prosperity in every area of your life: Spiritually, emotionally, intellectually, physically, relationally, vocationally, and financially. Discover 40 key practices for prospering your life every single day. A prosperous soul is your all-access pass to living a rich and satisfying life. Get ready to start enjoying the abundant life Jesus promised today! As a bestselling author, keynote speaker, and former senator of Bermuda, Dr. Cindy Trimm is a sought-after empowerment specialist, thought leader, and advocate for cultural change. Listed among Ebony magazine’s Power 100 as the “top 100 doers and influencers in the world today,” Dr. Trimm consults with civic, nonprofit, and religious leaders around the world. With a background in government, education, theology, and human development, Dr. Trimm translates powerful spiritual truth into everyday language that empowers individuals to transform their lives and their communities.